The first edition (working title: 2013 Saint Louis International) was held from 9 to 15 September 2013 at the Chess Club and Scholastic Center of Saint Louis in St. Louis, Missouri, United States. The four grandmasters played the classic time control (40 moves in 90 minutes with a 30-second increment as of move one, followed by 30 minutes for the rest of the game) in double round-robin tournament. 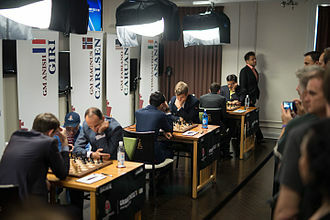 Magnus Carlsen, Levon Aronian, Hikaru Nakamura and Gata Kamsky faced each other. The total prize fund was $170,000, with $70,000 going to the winner, $50,000 to runner-up, $30,000 to third place and $20,000 to fourth place. The average FIDE rating for the field was 2797, the highest in chess history at this point in time. The opening ceremony took place on 8 September 2013, and round 1 began on 9 September 2013 at 13:00 CDT (20:00 CEST). This was the last tournament for Magnus Carlsen before his World Chess Championship 2013 match with Viswanathan Anand in Chennai, India. The second edition was held from August 27 to September 7, again at the Chess Club and Scholastic Center of Saint Louis. The event in 2013 was the strongest chess tournament ever held in the U.S. up until that time. The 2014 edition, however, is (numerically) the strongest in the total history of chess, as measured by actual average Elo ratings of 2802 for the six opponents, all in the top ten of FIDE's Elo rating list. The six grandmasters again played the modernized classic time control of 40 moves in 90 minutes with a 30-second increment for every move, followed by an additional 30 minutes plus the per-move-increment for the rest of the game, in a double round-robin tournament. With the six players present (Magnus Carlsen, Levon Aronian, Fabiano Caruana, Hikaru Nakamura, Veselin Topalov, and Maxime Vachier-Lagrave), the tournament consisted of ten rounds with 10 games to play for every participant. According to the FIDE rating, the players were the nos. 1, 2, 3, 5, 8 and 9 in the world. The total prize fund was increased to $315,000. After round 7, Caruana had achieved a score of 7-0, which was described as an "historical achievement" by Levon Aronian. Caruana finally finished the tournament with 8.5/10, with the highest ever performance rating in a single tournament, beating out Magnus Carlsen in the 2009 Nanjing Pearl Spring tournament and Anatoly Karpov in the 1994 Linares chess tournament. It was widely compared to Bobby Fischer's 20 game winning streak in 1970-71. The 2015 Sinquefield Cup was a nine game, single round-robin tournament. The time control for each round was of 40 moves in 2 hours, followed by the rest of the game in 1 hour with a 30-second increment from move 41. Wesley So was selected as the tournament invite and joined the nine other players already participating in the Grand Chess Tour.